“How sad,” I thought to myself. The image that has been burned into many people’s minds about Hasidic Jews (and Orthodox Jews more generally) comes from ignorance — or worse, from creeps and crooks of the community who always seem to make the most noise. That’s why we at Jew in the City love to tell the positive stories about Hasidim – like Alexander Rappaport, a Vizhnitz Hasid who grew up in Boro Park immersed in a world of unconditional giving to those in need. From the youngest age, Alexander was made aware by his parents and grandparents that there are hungry people around him everyday and that it is up to him to do something about it. Charity, he learned, is not something that is reserved for just wealthy philanthropists. It is an obligation that all people have towards one another. (In fact, the Hebrew word for charity is “tzedaka,“ which comes from the word “tzedek,” meaning “justice.” Charity is not considered going above and beyond, according to Jewish thought, it is simply what we owe our fellow man if he is lacking and we have the ability to give.) Even when Alexander’s grandmother was in the midst of the Holocaust she made the effort to help others find food. Her acts of kindness were repaid by the Nazis with beatings. After the war, once Alexander’s grandmother had a home and a table of her own, it was always overflowing with guests. She took in the people that no one else wanted. Alex’s father also always provided food and shelter for strangers in need, no questions asked. It was in this environment of constantly seeing acts loving kindness performed that Alexander began dreaming of a way to help even more people. In 2004, after a year of regularly talking with his Talmud study partner, Mordechai Mandelbaum, who shared his passion for helping the downtrodden and feeding the hungry, Masbia — “the restaurant without cash registers” — was born. The vision was to create a system where a large number of people could access food in a way that was as dignified as being a guest in someone’s home. A place where those who are struggling could forget for a few moments about how much they didn’t have. Alex saw a flaw in how every other soup kitchen is run. A hungry person can’t simply come and eat. No, in order to participate in the most basic necessity for survival – something that most of us do numerous times a day without thinking about it – the impoverished have to first pass through a screening process. Either through an invasive form, or worse, an extensive one-on-one interview, the average soup-kitchen-goer must prove his neediness. Budgets are examined, documents are requested. The act of food consumption becomes a shameful experience. I also wanted stories. “Tell me the stories of how you changed people’s lives,” I requested. As a person who runs a non-profit herself, it is those anecdotes that make so much of the hard work worthwhile. The answer I got was both surprising and inspiring: because of Masbia’s focus on dignity and respect, they not only avoid the screening process, they also avoid collecting information and stories from the people who come for meals, and have never conducted a survey or study of their “customers.” Why? Because they are just like any other restaurant: guests come and eat…period. There is, however, a cost to preserving a person’s dignity. A real dollars and cents one. Most soup kitchens receive at least half of their yearly budget from government funding. But because Masbia is stubborn in their refusal to make hungry people jump through hoops in order to eat, or to gather information on them afterward, the government only provides them with 10% of their yearly budget! Time and time again in almost a decade since its inception, Masbia hasn’t known where their funding would come from until it appears just in the nick of time. A couple years ago, they had payroll due the next day, but nothing in the bank to cover it. Then a New York Times article was published about them and suddenly a check for $25,000 came in, covering their budget for that month. And even just this week, they were almost in a pinch, unsure how the bills would get paid. Then People Magazine reprinted an article about Masbia that was published a few months ago in Nationswell and suddenly, from the publicity from the article, the funding they needed for this month was there. Great article. Thankful there are people in the world like him! Why can’t everyone have this insight to feeding the hungry?? This made my day! It’s so nice to see that there are people like this. Thank you to those who volunteer their time and donate to places like this. Thank you. Finally, someone who just does it out of the goodness of their heart. This is a great story we need more articles like this one to show the world that there are still many great people who care about humanity. Great job hope this catches on to other cities. Wow, with more like you, the world would be a better place. “Masbia” means satiate. It comes from a verse in Psalms, “Poseach Es Yadecha U’Masbia L’chol Chai Ratzon.” (You open Your hand and satisfy the desires of every living thing.) After thinking about the meaning of this verse, I realized that satisfying the desires of human beings is not just about looking after their physical needs with food. It’s also about fulfilling their most basic emotional needs – dignity and respect. This article was originally published on Jew in the City, sponsored by Masbia. This week Masbia is launching their Second Annual Charoset Drive. Based on sweetening the lives of their clients with apples, nuts and grape juice, ingredients of the charoset, Masbia’s Passover campaign raises money to provide seder staples for families and individuals throughout New York City. After recent cuts to SNAP (food stamps) and many other organizations not doing Passover campaigns this year, Masbia is bracing for a much larger need this Passover. In anticipation of greater support from New Yorkers across the city coming together to help, Masbia is expanding its program to provide 2,500 packages to New Yorkers in need, they will provide 180,000 meals, with a retail value over $500,000, with distribution sites in Brooklyn, Queens and on the Upper West Side. 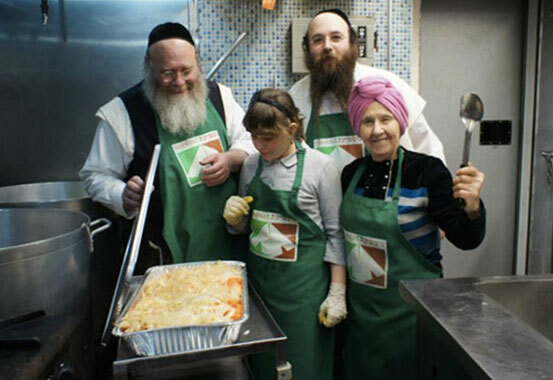 By becoming a donor to Masbia’s Second Annual Chaorset Drive individuals will help Masbia be able to expand their Passover packages to include items like eggs, potatoes, chicken and more. Make a donation today online at www.masbia.org/charoset or call Beau G. Heyen, Masbia’s Chief Development Officer, at 718-972-4446 x202 to learn about sponsoring specific items. Businesses and corporations that join as sponsors will have access to additional benefits and recognition.